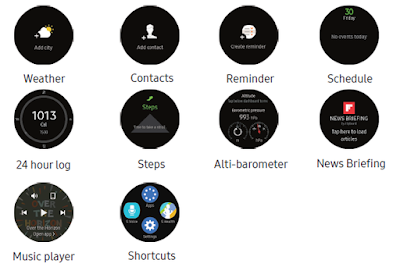 Gear S3 Home Screen Guide - Learn some of the key features of your Samsung Gear S3 home screen, icons, as well as how to navigate the device and enter text using the keyboard with manual Gear S3 settings. 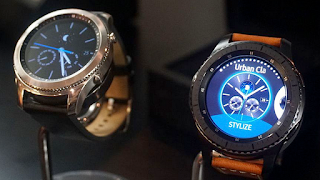 The Watch screen Gear S3 is the starting point for the Home screen. Rotate the bezel to view items on the screen, such as notifications and widgets. 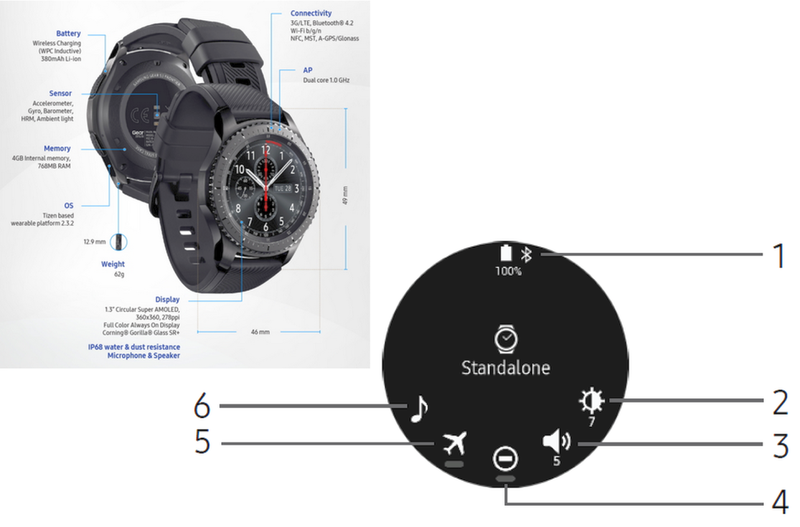 Here is Gear S3 manual to view the current time. You can also check the battery life, the date, your step count, and more. Options vary dependent on which screen is visible. Press the Gear S3 Home button to open the Watch screen when you are not on the Watch screen. Touch and hold the Watch screen, and then rotate the bezel to view available watch faces. You can add more watch faces by rotating to the last screen and tapping Get more watch faces. Tap the watch face to select it. You can customize the watch face by tapping Stylize. You can also change the Gear’s watch face on your Galaxy S8 smartphone. From the Apps screen of the smartphone, tap Samsung Gear > Settings tab > Watch faces. Stay up to date with events, notifications, and messages from your smartphone. When you receive a notification, it is displayed at the top of the screen and disappears after a few seconds and the Gear vibrates. Rotate the Gear S3 bezel left. Tap the notification screen to view the notification’s detail. Rotate the bezel left to view notifications. Tap the number at the bottom of the screen. Swipe upward from the bottom edge of the screen to delete all notifications. Select a notification from the app you want to block. Tap the notification to view the details. Tap More options, rotate the bezel to Block app and tap Block app. The Gear no longer receives notifications from the app. You can block specific app notifications before you receive them by using the Limit notifications settings on your smartphone. You can add Gear S3 widgets to the Home screen. Widgets are small apps that offer limited functionality to provide information and convenient access. Rotate the bezel to the end of the Widgets, and tap Add widget and select a widget. The selected widget is displayed in a new panel. This Samsung Gear S3 panel allows you to view the current status and configure basic Gear S3 settings. On the Gear S3 Watch screen, swipe downward from the top edge of the screen. Status bar: Displays device indicator icons. Sound: Adjust the device volume. Do not disturb: Block all notifications and alerts. Airplane mode: Disconnect your device from all networks and turn off connectivity. Music player: Play music from your Gear. Indicator icons display at the top of the screen. The icons listed in this table are most common. Airplane mode: Airplane mode is enabled. Bluetooth connected: Bluetooth is connected. Bluetooth disconnected: Bluetooth is disconnected. Bluetooth headset connected: A bluetooth headset is connected. Wi-Fi connected: Wi-Fi® is connected. Battery full: Battery is fully charged. On the status panel, tap Brightness and adjust the brightness by rotating the bezel. You can adjust the Gear’s sound settings. On the status panel, tap Sound and adjust the sound by rotating the bezel. You can set the Gear S3 not to vibrate and turn off the screen when a notification is received (except for alarms). On the status panel, tap Do not disturb. The Do not disturb icon is displayed at the top of the Watch screen. Airplane mode disconnects your S3 from all networks and turns off connectivity features, such as phone calls and Wi-Fi. On the status panel, tap Airplane mode. The Airplane mode icon is displayed at the top of the Watch screen. You can save and play music on the Gear S3 or smartphone. On the status panel, tap Music player.